Court decisions, regulations, and new legal policy developments have been flying around so fast and furiously this month that we at The Legal Pulse have until this morning not offered our congratulations to one of Washington Legal Foundation’s pro bono authors and speakers, Patricia Ann Millett of Akin Gump Strauss Hauer & Feld LLP. 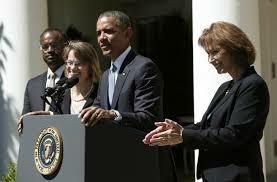 On June 4, the President nominated Patti for a judgeship on the U.S. Court of Appeals for the D.C. Circuit (she’s standing to the right of the President in the photo). Along with colleague Hyland Hunt, Patti expanded upon the thoughts she provided at the October 2011 term review on the Court’s preemption rulings in a September 23, 2011 WLF Legal Backgrounder, Crumbling Cornerstones: The Evolution Of Preemption Law In The Supreme Court’s 2010 Term. Will Expanding Post-Grant Review Deter Abusive Patent Litigation?